In a modern renderer, relying on recursive ray-tracing, the number of shader calls increases by one or two orders of magnitude compared to a straighforward rasterizer dealing only with camera-visible objects. Recognizing the potential overhead of RSL parsing in all these shader calls, this report evaluates different C++ pre-compiled alternatives. Most of our current shaders are written using RSL. The main advantage is ease of development and use: the shader writer only needs to code a standard scalar version and the compiler is going to parallelize it to run on multiple shading points of a grid. Since RSL is byte-code compiled, it can suffer a performance penalty compared to binary compiled languages. However many shading points are run in parallel and thus this cost has always been assumed to be leveraged. Unfortunately, with the introduction of ray tracing, it is getting more and more difficult to shade multiple points at once, since divergent rays are likely to hit completely different objects and shaders. In practice, for an indoor scene, where almost every ray hits something, we found that 80% of the shaders can't be combined. As shown in the statistics, the average grid size can drop to a few dozen shading points (or even less). In this context the overhead of interpreting RSL becomes non-negligible. In section 2 we will discuss different versions of our shader and the cost of porting it to different languages. In section 3 we will present the results of those different versions, and then conclude in section 4. Example code is offered in an Appendix. In RSL, a shader is written as it is handling only one shading point, prman will automaticaly perform the same operations on all the shading points of the grid. The shader only have to differentiate, per grid operation and per shading point operation by using the 2 keywords uniform and varying in front of each variable. Those three functions have dependencies and need to be called in this particular order. In all the following pseudocode, we will consider that we have an M points grid and we are taking N samples on each of these shading points. When porting this code to C++ it is now up to the shader writer to perform the loop over the shading points of the grid. The three different functions are now in three different parts of the loops (the grid operations are completely outside). The translation to C++ is pretty straighforward and easy, RSL syntax being very close to C in the first place. 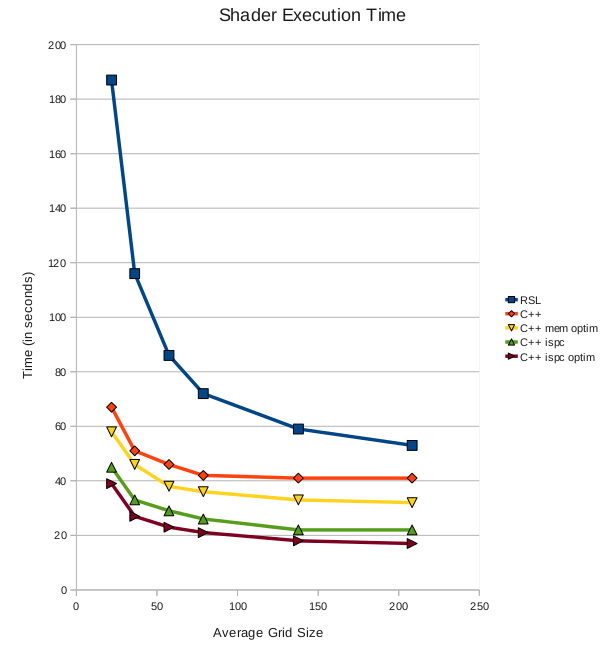 Just porting the code to C++ gives more than 20% speedup for large grids and more than 60% on small grids. That means it is far more efficient to perform adjacent read per shading points than read per samples. One difficulty here is that in do_per_sample_per_shading_point_operations() we usually need to use the result from do_per_shading_point_operations(). We have to store the values computed in the first loop to be used in the second loop. Since we want to avoid doing a malloc every shader call (which can be called billions of times), we reserve a memory pool in a per-thread memory storage. This is possible since the shader is not reentrant. 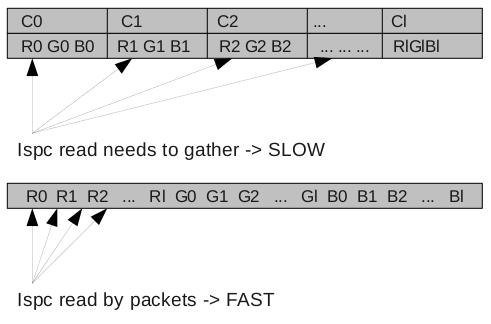 Changing the loop order gives us an additional 20% speedup for large grids and 10% for small grids. ispc is the new Intel spmd program compiler. It uses a C-like syntax and generates a .o file that we can link as usual into a DSO. The difference between ispc and other parallel programming librairies is that ispc operates on SIMD lanes, while others are focusing on utilizing multicores. ispc performs optimizations and tranforms the program in a vector intermediate representation of LLVM. Then the final compilation is handled by LLVM. Internally, ispc is going to run multiple instances of the program at once. The group of running program instances is called a gang. Porting C++ code to ispc is really easy; it is almost a copy & paste. The only changes are the loop declarations: instead of using the classic for() loop, we use the ispc specific foreach(). Also, we now have two extra qualifiers for variables: uniform and varying. One thing to be aware of is that the uniform and varying qualifiers have a slightly different meaning in ispc and in RSL. In RSL varying means varying between shading points. In ispc, varying means varying between program instances within a gang. So a varying element in RSL is likely to be an uniform array in ispc. Pointers to this uniform array are going to be varying, since every program instance is going to process different locations in this array. Just porting the code as-is to ispc provides a 30% speedup for large grids and 20% for small grids. We can make the ispc code even faster. uniform conditionals are optimized in ispc, but ispc also provides an improved if for varying conditionals. These are called consistent branchings (cif, cwhile) and hint to the compiler that the result is likely going to be the same for all the points. This will create a special optimized code path for this branching. Changing the array memory layout is going to have an impact on the whole shader system, so this time we only modified the layout of local arrays. By doing those two changes (consistent branching and optimized memory layout), we were able to get an additional 25% speedup for large grids, and 15% for small grids. For large grids, ~200 shading points, the move from RSL to ispc gave us a 3x speedup. For small grids, ~20 shading points (which are likely in a ray tracing context), the speedup is more than 5x. The speedup ratios when going from C++ to the slightly optimized ispc code are, respectively, 2.5x and 1.7x. Shader execution time is largely dominant in our renders. When people are complaining about the cost of ray tracing, it is usually the cost of ray hit shading that is the bottleneck. In an indoor scene, the ratio of the ray shading time to the ray tracing time can reach 10 easily (e.g. 5 hours of tracing, 50 hours of shading). Right now, this cost is masked by using exclusively the radiosity cache at ray hits, meaning we are giving up all view-dependent (specular, reflection, ...) components in secondary contexts. If in the future we want to perform "full" ray-tracing, we need to address the shading time problem. Porting our shaders to ispc might be one part of the solution. ispc is picky in the handling of consistent ifs. Compilation time goes from 5s to 50s by using only a few of them. Replacing all the ifs with cifs we were not even able to get a full compilation. ispc generates optimized code for each cif scenario, so the .o can get pretty big. In our case the object file doubled in size, which is still reasonable, but might become a problem if we use use too many of them. From the coding point of view, almost all of difficulty in porting shaders from RSL to ispc was in the second step, when reverting the two loops. Compared to this step, going from RSL to C++ and then from C++ to ispc is relatively easy and is likely to be be less than a day of work for any experienced programmer. Intel MIC/Larabee2 will have hardware gather/scatter. It may then become less important to have to convert arrays of structs (such as colors) into structs of arrays (per component arrays). Going from RSL to C++, we naturally get bigger gains for small grids. However, once in C++, we can still optimize large grids by vectorizing and optimizing the memory accesses. Overall we are able to speed up all cases. The following function - emissionAndPDF() - is from the spherelight production shader.